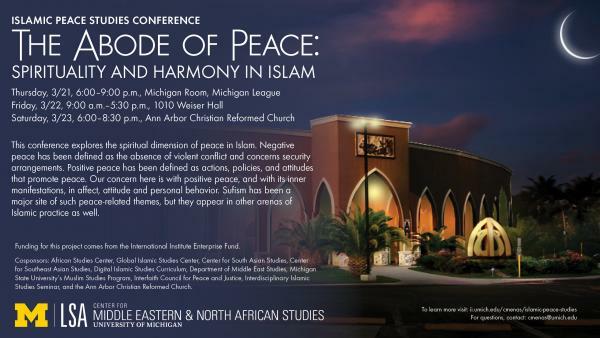 This conference explores the spiritual dimension of peace in Islam. Negative peace has been defined as the absence of violent conflict and concerns security arrangements. Positive peace has been defined as actions, policies, and attitudes that promote peace. Our concern here is with positive peace, and with its inner manifestations, in affect, attitude and personal behavior. Sufism has been a major site of such peace-related themes, but they appear in other arenas of Islamic practice as well. Evening Keynote, “Reframing Peace: Muslim Stories of Peacemaking for the 21st Century,” with Dr. Irfan Omar (Marquette University) at 7:00 pm. Dinner starts at 6:00 pm. All day conference with presentations by Professors Juan Cole (University of Michigan), Valerie Hoffman (University of Illinois), Alexander Knysh (University of Michigan), Jennifer Nourse (University of Richmond). Presentations by Professors Juan Cole (University of Michigan), Valerie Hoffman (University of Illinois, Alexander Knysh (University of Michigan), and Jennifer Nourse (University of Richmond). Dinner starts at 6:00pm. Presentations will begin at 6:30pm. Funding for this project comes from the International Institute Enterprise Fund. This event series is free and open to the public. Cosponsors: African Studies Center, Global Islamic Studies Center, Center for South Asian Studies, Center for Southeast Asian Studies, Digital Islamic Studies Curriculum, Department of Middle East Studies, Michigan State University's Muslim Studies Program, Interfaith Council for Peace and Justice, Interdisciplinary Islamic Studies Seminar, and the Ann Arbor Christian Reformed Church.